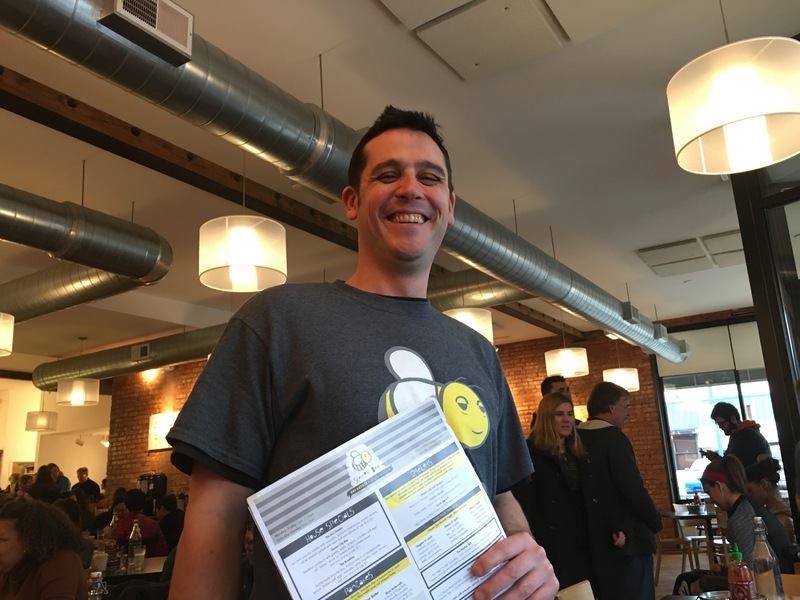 Sleepy Bee Cafe in Oakley – Go There. Try That. 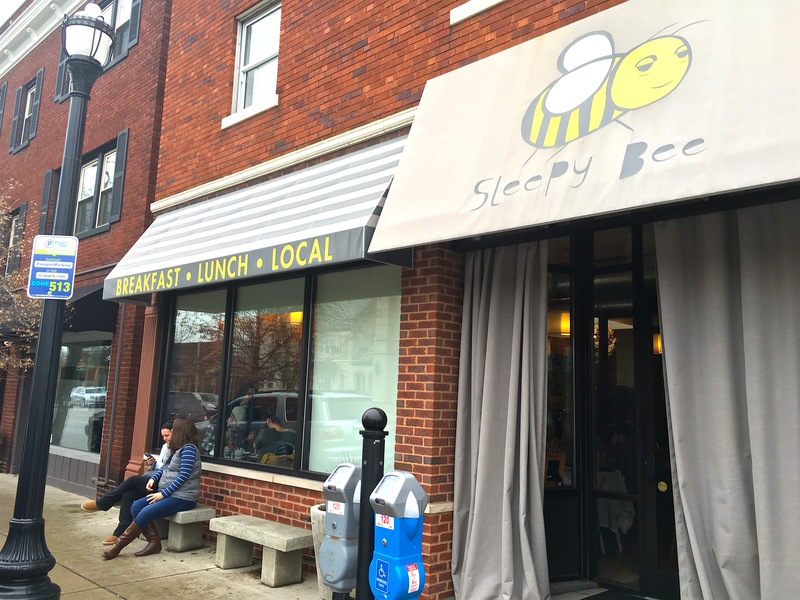 Sleepy Bee Café (SBC) sits nested in the heart of Oakley, an ever growing and thriving neighborhood in Cincinnati. 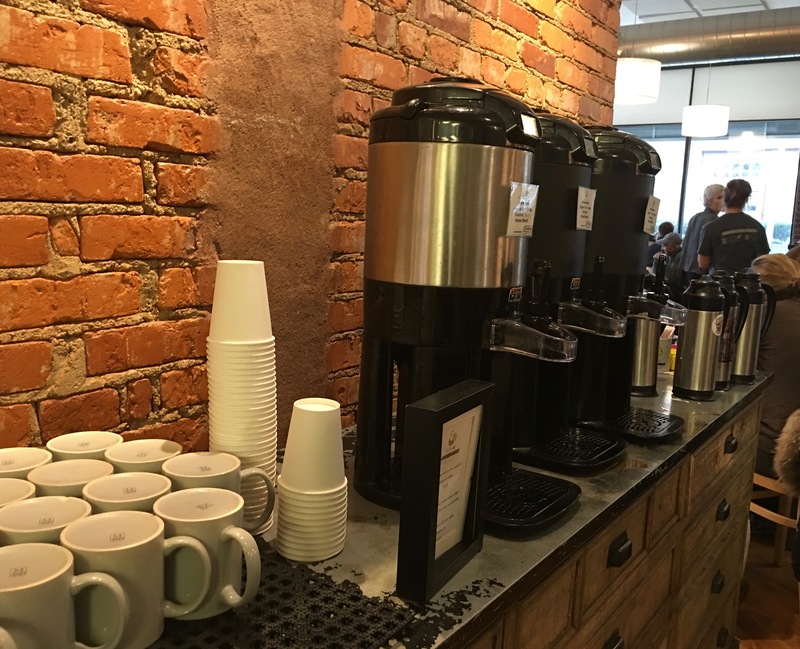 SBC provides a space that offers more than just local, fresh, and flavorful food – it gives a sense of comfort and familiarity. 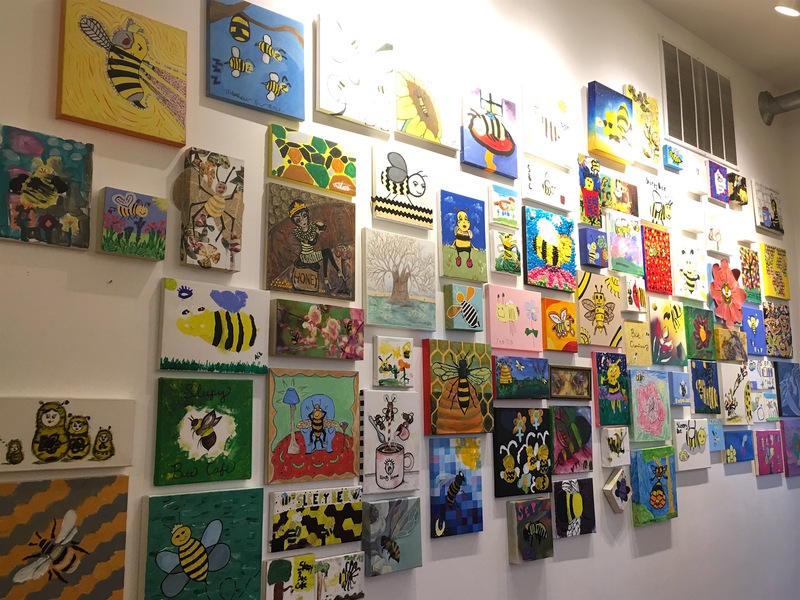 The walls are lined with local art, and books from the nearby Blue Manatee bookstore are provided to keep young kids entertained. They are very conscious of dietary restrictions and have many options for vegetarians, vegans, gluten-free, and anything in-between. The staff is always friendly and more than happy to tell you the history of the place. Oakely location- be sure to pay those meters. Special shout-out to our server, Dylan! He actually waited on me (Mindy) twice; he’s the best! What makes SBC so special is their support of local ingredients from local businesses – dairy comes from Snowville Creamery, maple syrup from Richard’s Maple, coffee from Coffee Break, and bacon and goetta from Eckerlin Meats. These are only a few of the organizations that help make your meal. Enjoying a moment at SBC, while certainly making your tummy happy, also supports our local economy. And that is always a good thing. Coffee from Coffee Break Roaster in Cincinnati. It’s Fair Trade! 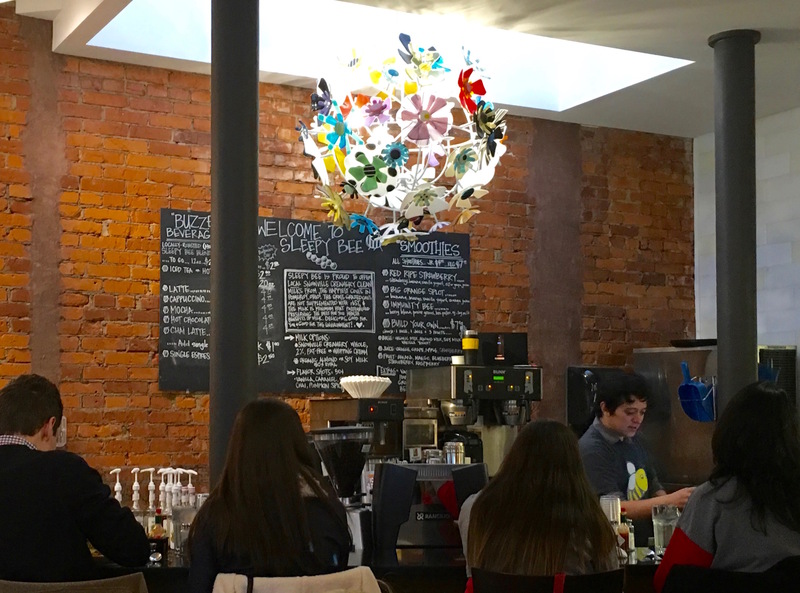 While they are probably best known for their light and fluffy buttermilk pancakes, SBC has many other great dishes and is always offering daily specials. One of my favorites is a variation of their pancakes – Bee Cakes (gluten free) – topped with peaches and granola. A full order of Bee Cakes is enough to feed two people, or you can save half for later, like I do. Give me a cup of Coffee Break coffee with a splash of almond milk and I am one happy little bee. While Rachel likes the gluten free pancakes, I went for the buttermilk. Fluffy and filling! This one has banana, natural peanut butter, and chocolate. Blueberry and banana buttermilk pancakes; love that this bacon is nitrate free! 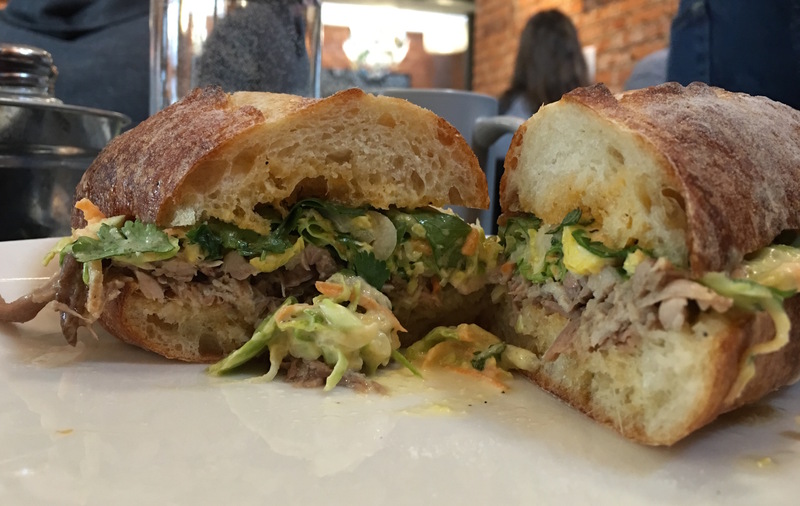 If you want something with a little more Cincinnati flair, try the Queen City Bee sandwich. 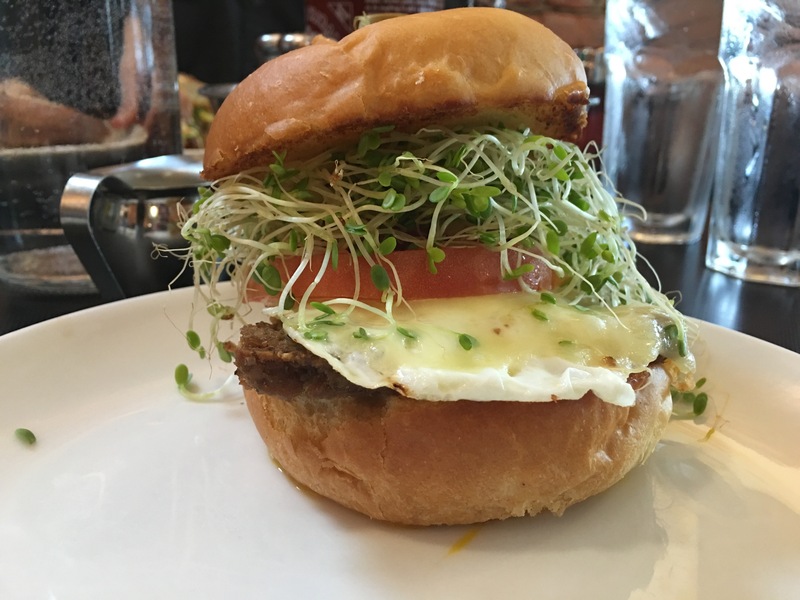 Eckerlin goetta, arugula, apple, a broken egg yolk and nectar sauce (their house sauce) are all stacked between two pieces of ciabatta bread from local bakery Sixteen Bricks. This house special is sure to please….and worth the mess it will probably cause. Come prepared with a stack of napkins. 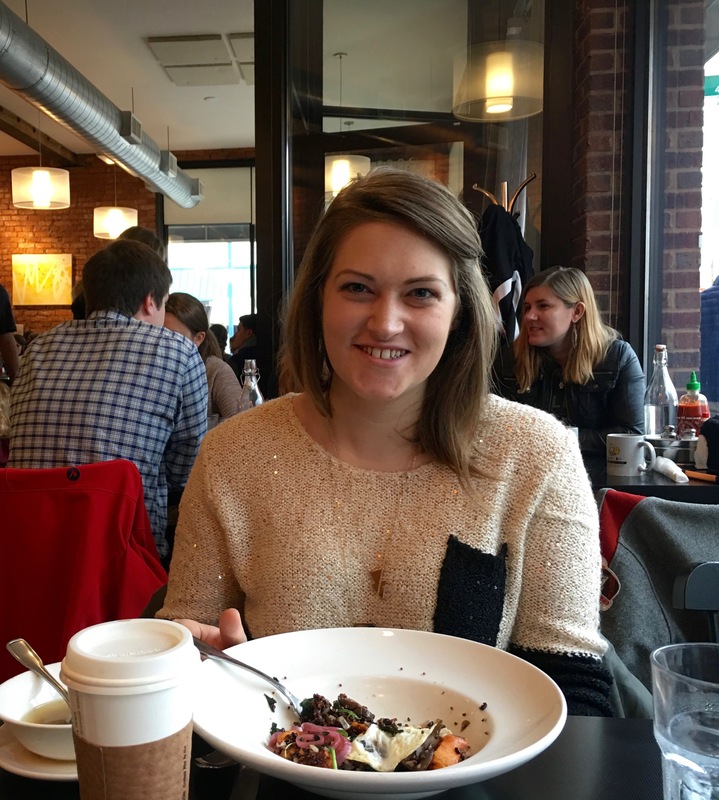 Mindy here- I ordered this breakfast sandwich and it was glorious! Messy and glorious. This was a breakfast special-slow roasted pulled pork, sriracha bacon aioli, Brussel sprout endive slaw, pickled jalapeño, on 16 bricks bread! 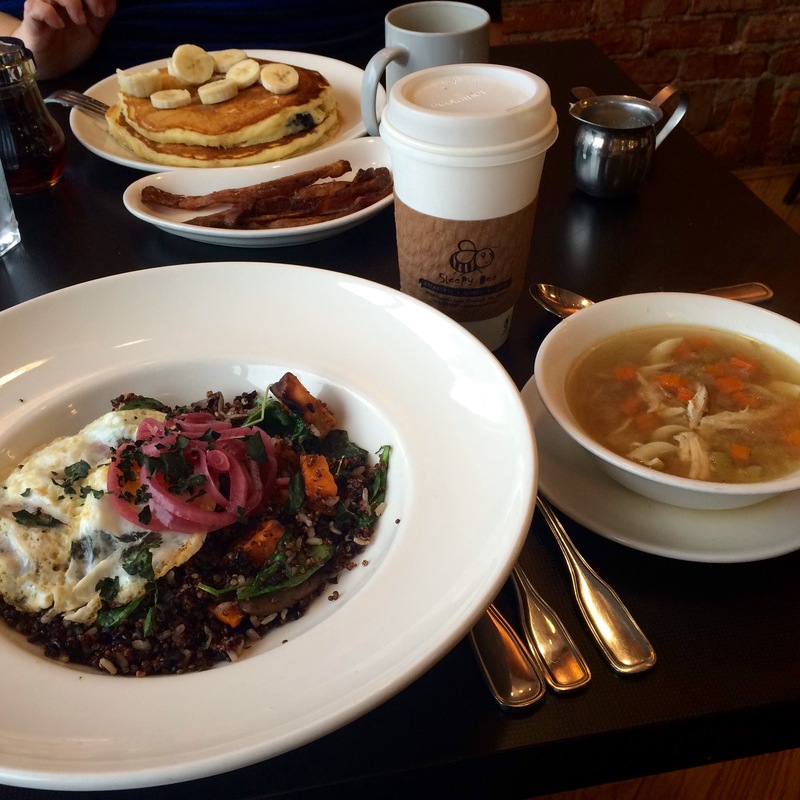 When Mindy and I had brunch together, I enjoyed the Warm Quinoa Bowl with an over easy egg, a cup of chicken noodle soup (which came highly recommended by our waiter), and a Honey Lavender Latte. Warm quinoa and wild rice was topped with crispy kale pieces, sweet potatoes, pickled onions, mushroom, and sautéed spinach. The chicken noodle soup warmed my body on a cold winter day. And the latte just perfect – sweet, hot, and perfect for sipping slowly in the company of others. Quinoa bowl with over easy egg. While SBC Oakley will always have my heart, there is also a location in Blue Ash, for bees who don’t live near the Oakley area. Blue Ash is larger and usually less crowded, so it may be the place to go when you are pressed for time. 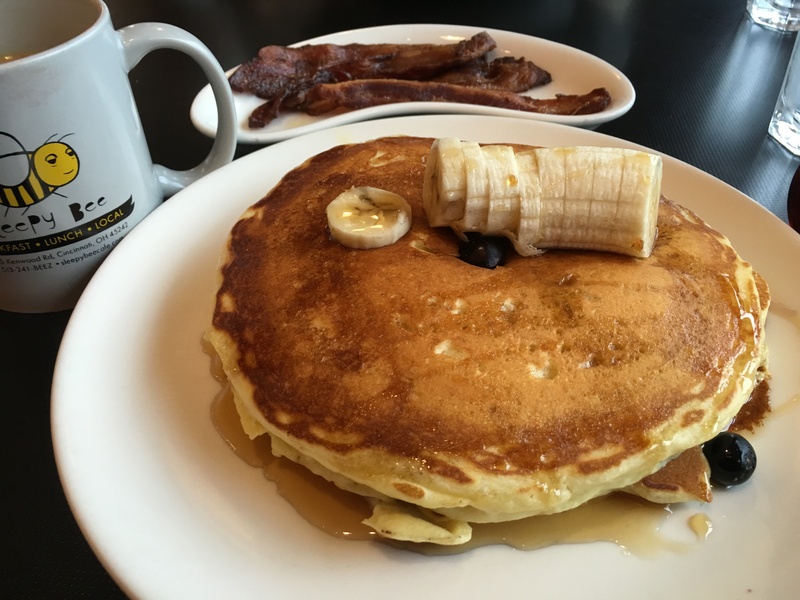 So this Saturday when you need a place for brunch with your friends, grab a coffee and some pancakes from Sleepy Bee Café. You’ll be supporting local businesses, eating some fantastic food, making memories, and enjoying local art. What more could you ask for? 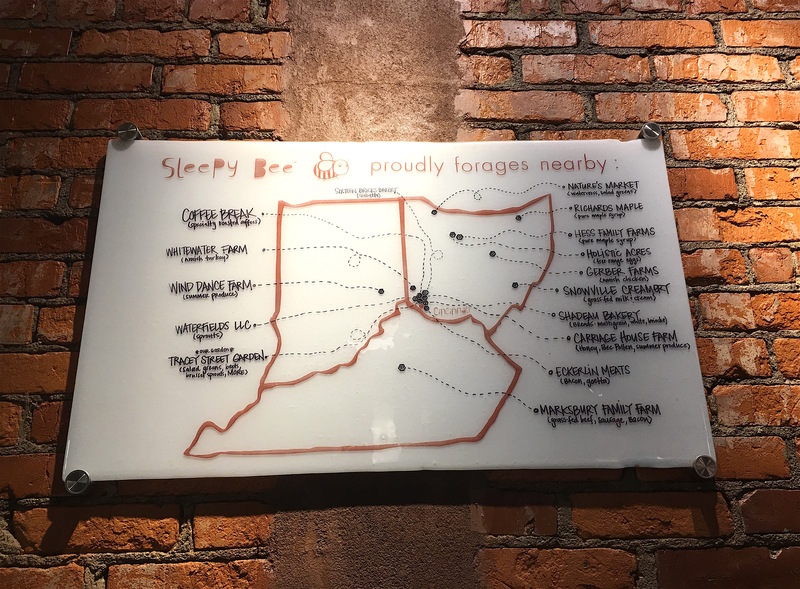 GO THERE (Sleepy Bee Cafe)! 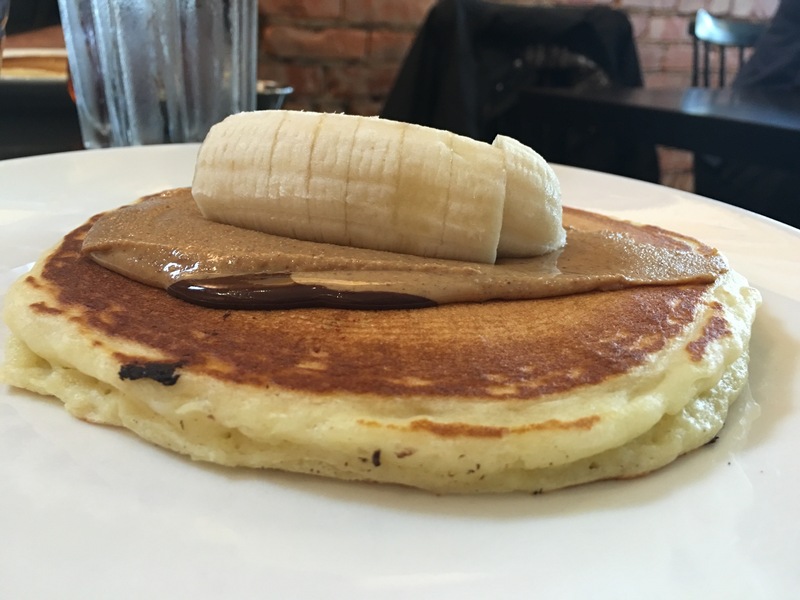 TRY THAT (pancakes, bacon, Queen City Bee, quinoa bowl)! I need to go back! We went once and liked it a lot! Dylan! Best server ever! I’m completely sold on Sleepy Bee! Glad to let my readers know and I look forward to seeing you soon!